Nutty poo makes a happy squirrel! Our Nuttier Than A Squirrel Turd shirt is a very cute and funny design featuring a happy squirrel appreciating the nuttiness of his excrement. This Nuttier Than A Squirrel Turd shirt was made to print beautifully on any color or style shirt we have available so be sure to play around with different colors, settings and styles to find the right one for you! 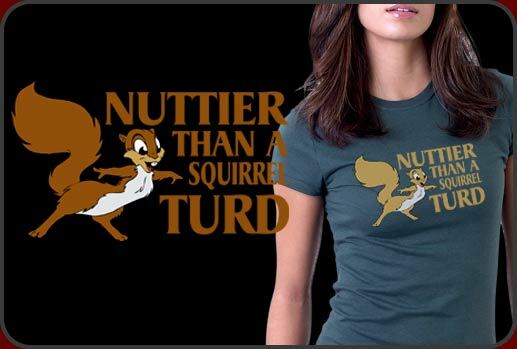 You can customize your Nuttier Than A Squirrel Turd shurt in hundreds of ways! We have Nuttier Than A Squirrel Turd available in men's, women's and kid's shirts and even have the Nuttier Than A Squirrel Turd design on posters, buttons, hats, mugs and more!